Casa Pedro - nice but cheap! Casa Pedro is a little-known eatery found in Las Chafiras, an area roughly halfway between the south coast resorts and the south airport. This is really a hidden gem and is known only to a few ex-pats, certainly not many tourists. It is a restaurant with an unassuming exterior, tucked away down a side street. Doesn't look much from the outside, does it? When you enter the place, you may think “what on Earth is this?” because you walk into a typical (and small) Canarian bar, where there may be Tenerife manual workers enjoying (quite loudly) a drink after finishing their shift. But you go through to a very pleasant, rather basic dining room. Typically Canarian, Casa Pedro has no menu, but all the food available (meat, seafood, etc) is on display and you select what you want. Staff (speaking good English) are on hand to talk you through it. Starters are steaming away in large tureens and you can inspect these, too. Food is excellent, as are prices. The boss, Pedro, as in the name of the restaurant, is usually there, waiting on tables with the best of them. Food is great - I usually have the “solomillo” [solo-ME-yo](steak, to you and me). 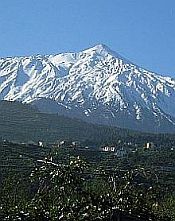 Wine is served in the traditional Canarian way, siphoned from a large vat into an earthenware jug, quarter-litre (quarto litro), half-litre (medio litro) or litre (litro). I expect you will find the prices very reasonable, too. 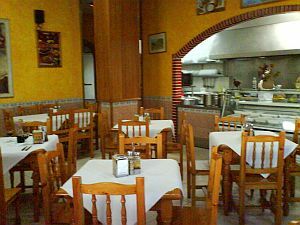 We have been there many times and, all in all, Casa Pedro provides a very agreeable, cheap dining experience. To find it, exit the TF-1 motorway at junction 26. 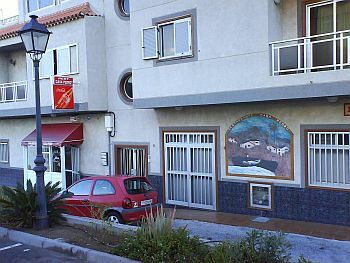 If from the Los Cristianos direction, take the left hand lane on the slip road, taking you to the roundabout. If from the other direction, you'll find the slip road branches into two. Take the left one, which brings you to a roundabout, where you take the first exit, passing over the motorway, to the aforementioned roundabout. From this roundabout, take the third exit and, down this narrow side street, you'll see Casa Pedro on the left - if you look closely!